It’s only been a year and a half since we last reported! Well, when you’re not gainfully employed you don’t have the funds for house projects, even DIY. But yer girl has a job now, so let the games begin. Like the last house, this one has had some “makeovers” over the years… All well-intentioned I’m sure, but wow, some ugly choices have been made. 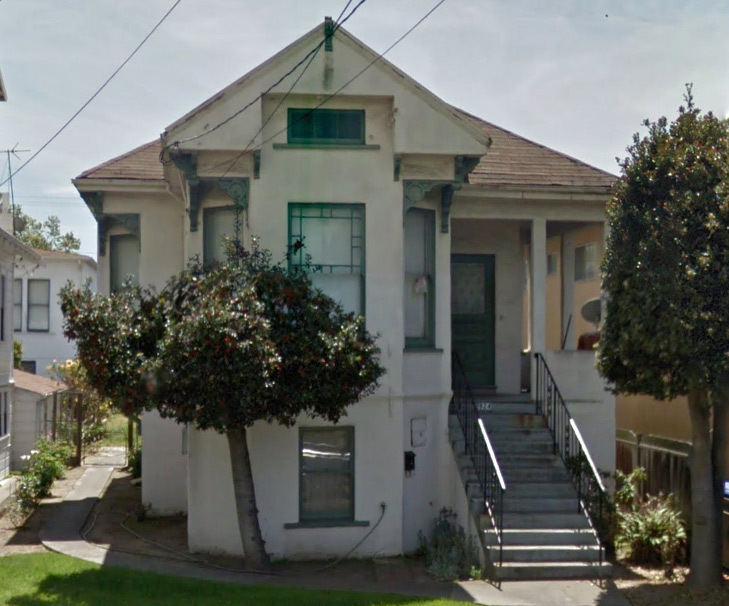 This neighborhood was working class and low income for the second half of the 20th century and many of the stately old houses had fallen into disrepair. 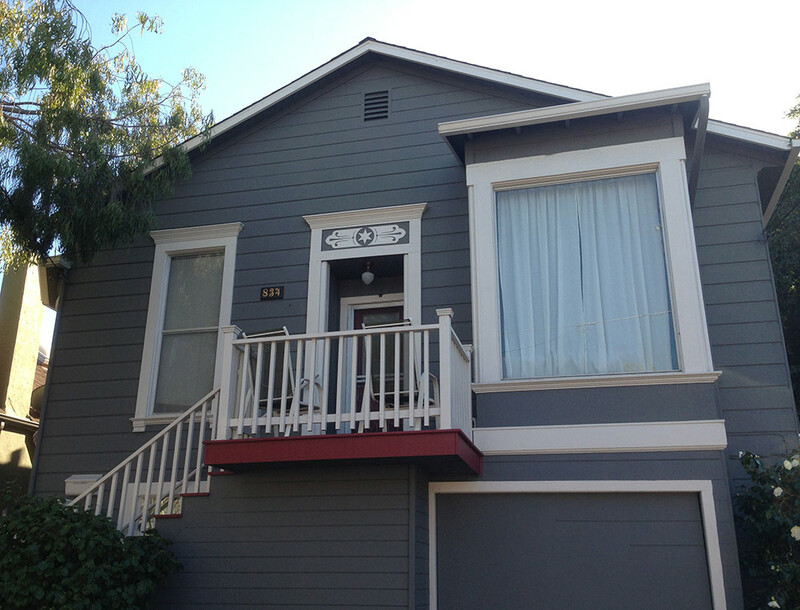 In the early 90s our house was rehabbed and it reflects the style of the time. 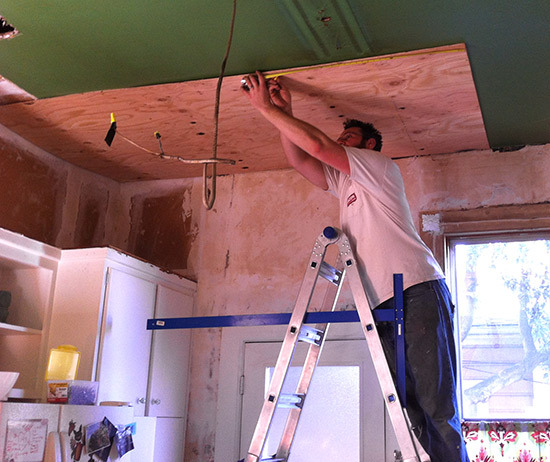 Unfortunately that meant textured ceilings and walls, and many mouldings removed. 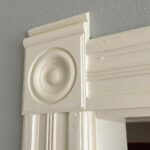 Mouldings like the ones on all the doorways of the main level. These passages were then lined with orange-peel drywall and nothing else. DON’T even get me started on that wonky arch over there. Actually do! This whole thing is really just a practice run for taking that thing down. 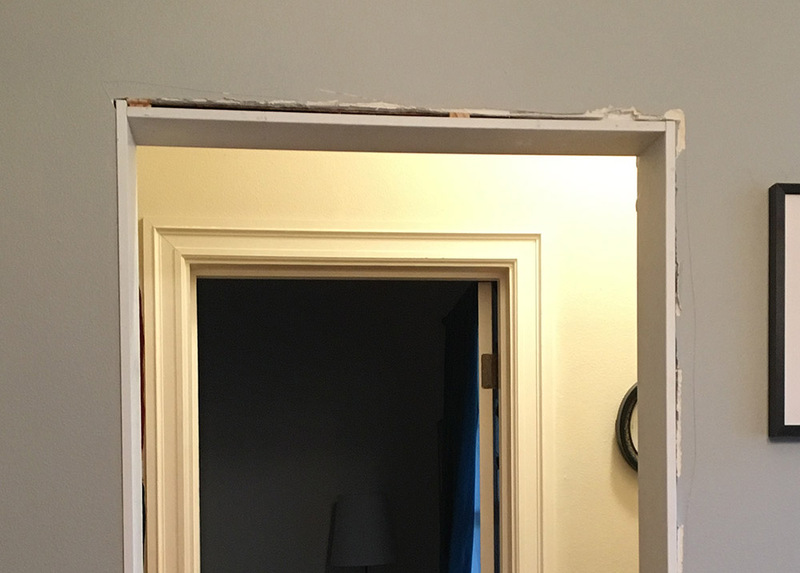 I want to make sure I know how to frame a doorway before I tear the arch out. Anyway, check out this hideous dining room doorway behind my big head. 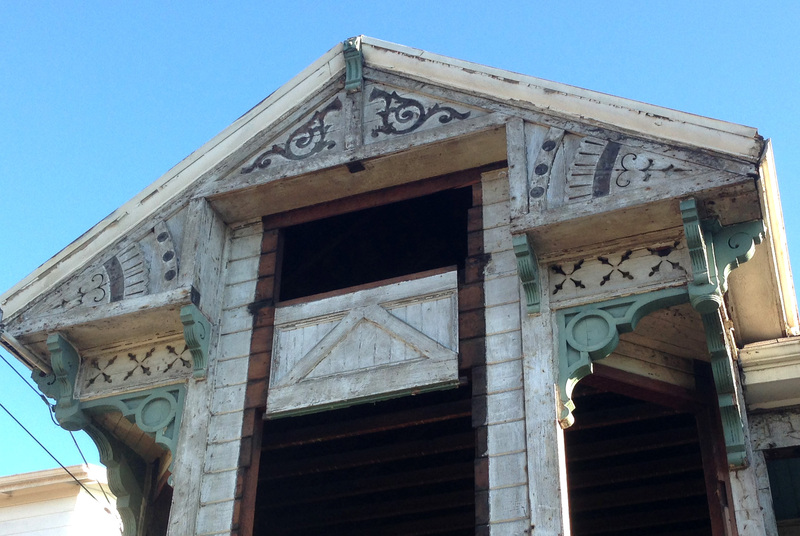 Not all of the house’s mouldings were purged. The living room windows still have the traditional casings and bullseye rosette corners, so it wasn’t hard to guess how the doors should look. 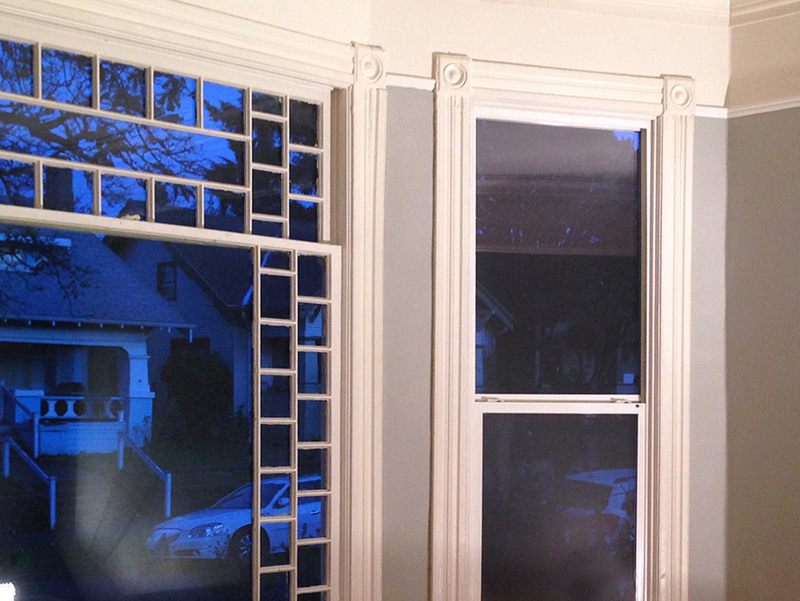 I’ve found moulding at two local salvage places that matches the profile of our window casings. It’s banged up and in pieces of various lengths and finishes, but the flaws seem appropriate to me for the age of the house. Every old house I’ve ever lived in has been well-worn and far from pristine, so to my mind, it fits. 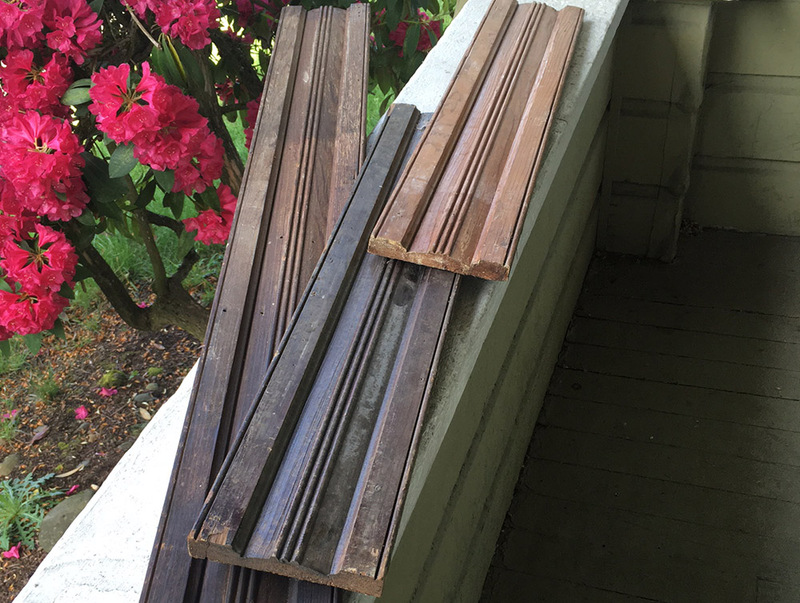 I also found some corner rosettes of the correct size (5.25″) but they didn’t quite match so I bought some newly milled ones as well as some plinth lumber (for the base blocks) from McCoy Millwork. There’s better places for historical woodwork, but these guys are local and I could go in and figure out exactly what I needed in a hands-0n way. 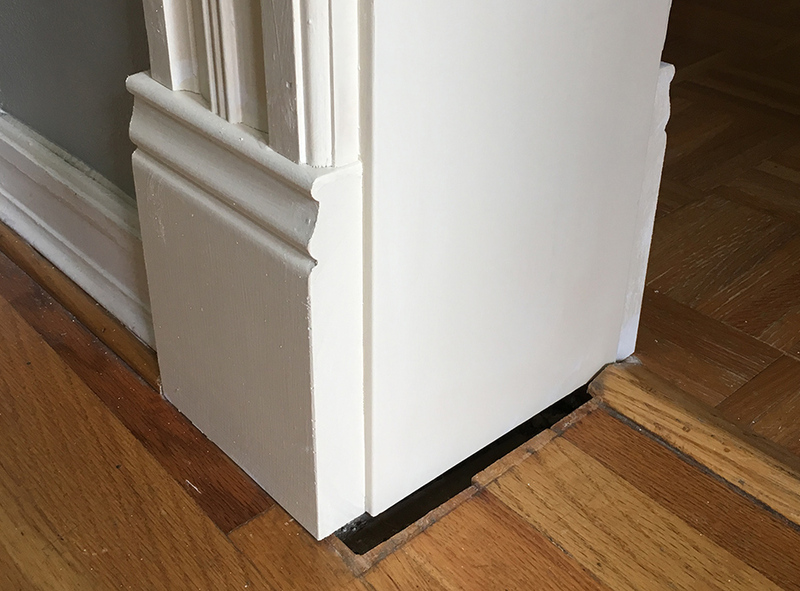 Once the jamb is nailed solidly into the framing, then it’s just a matter of applying the appropriate casing around it to cover your tracks. I added the little crown piece to the top of the corner block because I’ve always liked that look. You can see the many dings and holes that the lumber has, but again, that just makes it look to me like it’s always been there. One problem though: The flooring doesn’t extend to the wideness of the new doorway. The drywall that had lined it was really thick and in removing that we’ve gained about a half-inch on either side. I may just throw down some oak quarter-round to cover it. 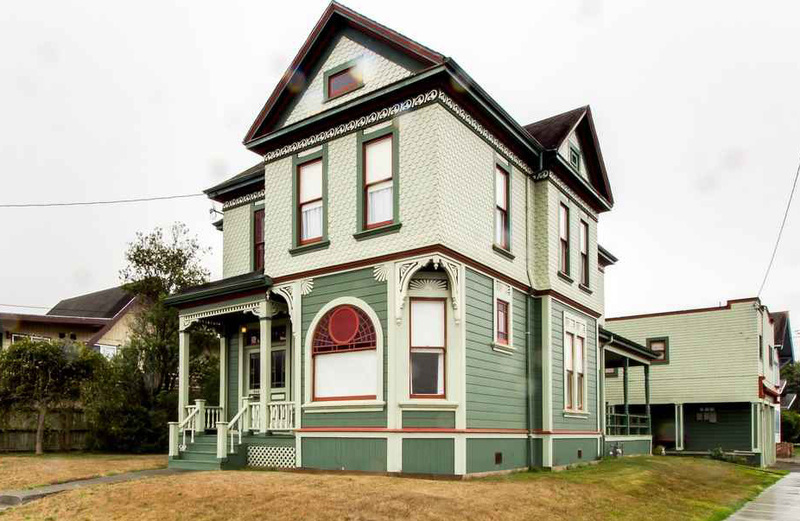 The Petch House is a 3000 sq ft, 1895 Queen Anne in Eureka, CA. It’s named for the original owners, Thomas and Phyllis Petch. I know of this house because Greg DeBacker bought it in 2002 and blogged about his renovation from 2005 until 2012, at which time the site went silent. He did an incredible amount of work on what started as the neighborhood crack house, and documented most of it on the blog. 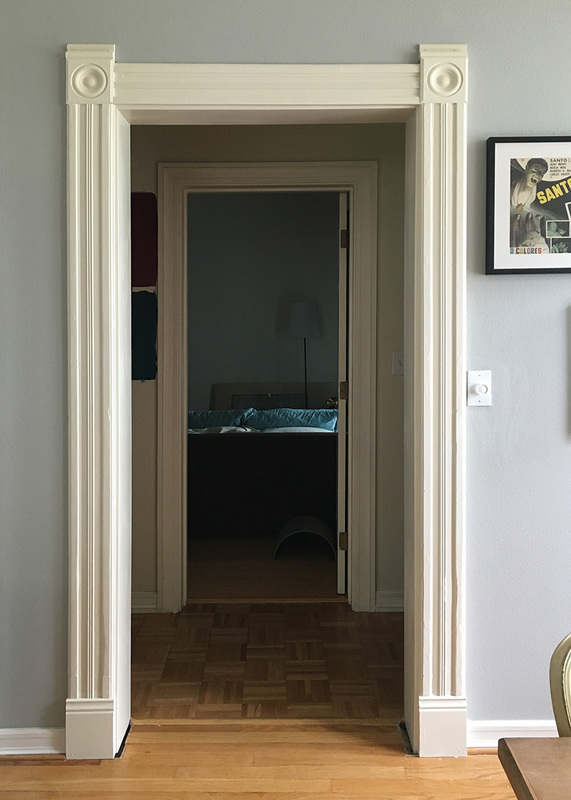 It’s one of my favorite house blogs ever because it’s thoughtful, dirty, and has a beautiful and meticulous attention to detail. This entry gives the history of the house. I don’t know what happened between 2012 and now, but the house has come up for sale. I hope it’s being sold for some fantastic reason, and I hope all Greg’s hard work felt worthwhile. It really looks like it was. Life has been more complicated than I really indicated in my last post. I got laid off from my job shortly after we got the house, so since then I’ve been picking up freelance design work and thinking a lot about my future. I’ve decided to try doing real estate. I’m about halfway through the study now, and I’ll hopefully be licensed as a broker by the end of the year. It’s not so much that I want to sell things to people, it’s more that I love old houses and want to see them in the hands of people who want them as badly as I do. So we’ll see. It seemed like something a lady my age is inclined to do, and I would like to work for myself at some point. In the meantime, my sweetheart has been supporting us by continuing to commute to the Bay Area during the week. It’s been stressful on us (him, much more so), but he has a good job that’s given us insurance and enough to get us by while I’m not earning much. He’s a trooper. Because of our limited income, we’re on a strict budget that hasn’t allowed me to start all the projects this house is clamoring for. So I guess what I’m saying is it’s going to be slow going for a while. So you know, stay tuned for the next several years! No rush here. Hi guys. As I mentioned, we moved to Portland from Alameda last July. It’s had its ups and downs, but it was definitely the right decision. 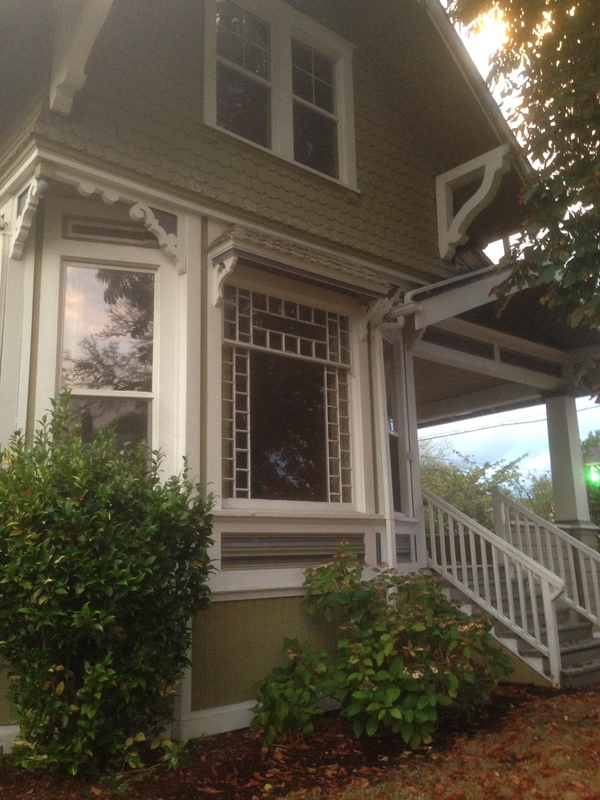 In December we moved from our temporary apartment to the house we bought in the Piedmont neighborhood of North Portland. 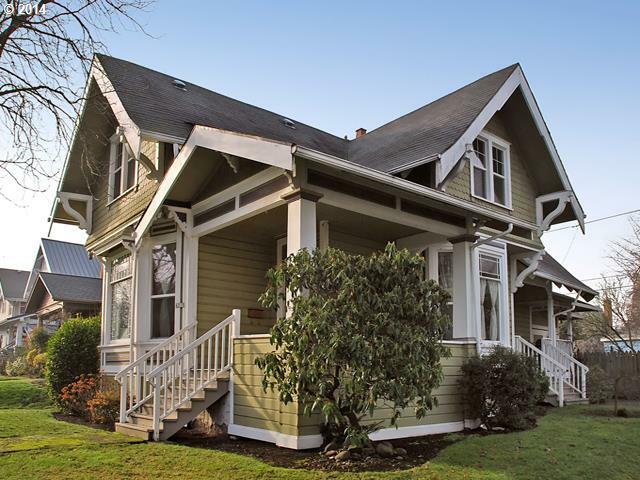 Portland is crammed with bungalows and Edwardian-era four-squares and I didn’t think we were going to end up in another victorian, but we did. We found it quickly, but we only got it through bargain shopping and luck. It had been a rental for a few years and was a little beat up, the owners lived out of town, and it may have been priced a little high at first, so it was languishing on the market. We scooped it up with the help of a very sharp real estate agent. I was hugely excited about the photo above (a digitally produced copy of the original) that came with the house. I don’t know who those people are, but they are presumed to be the first owners. I like to think about the place being haunted by squealing teen girls. 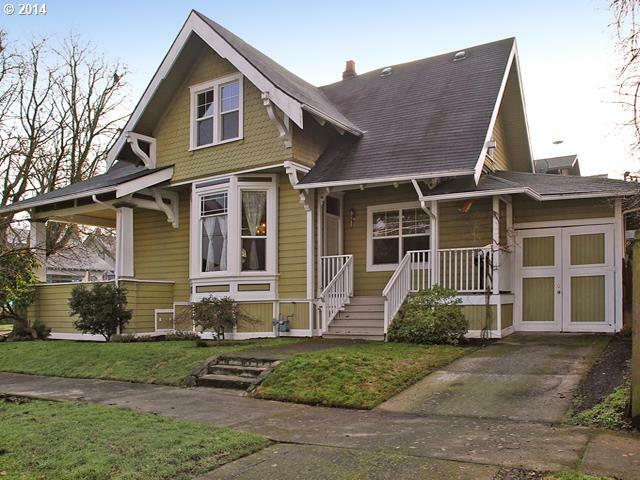 You can see from the pictures below that it got a bit craftsman-ized along the way, to better match the majority of the homes in the neighborhood. 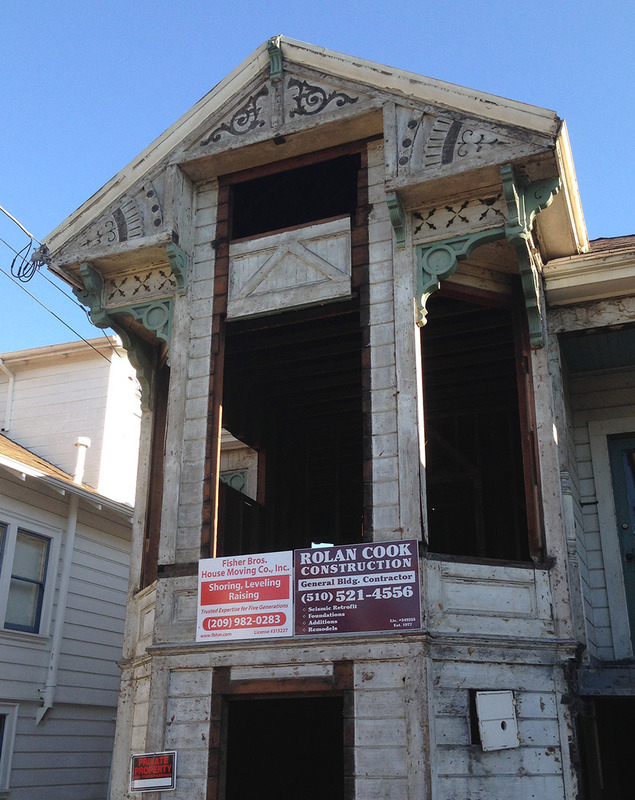 I have mixed feelings about that – it lost a little bit of the millwork and some of the stained glass, but it gained a big porch. This is an insane house for us. 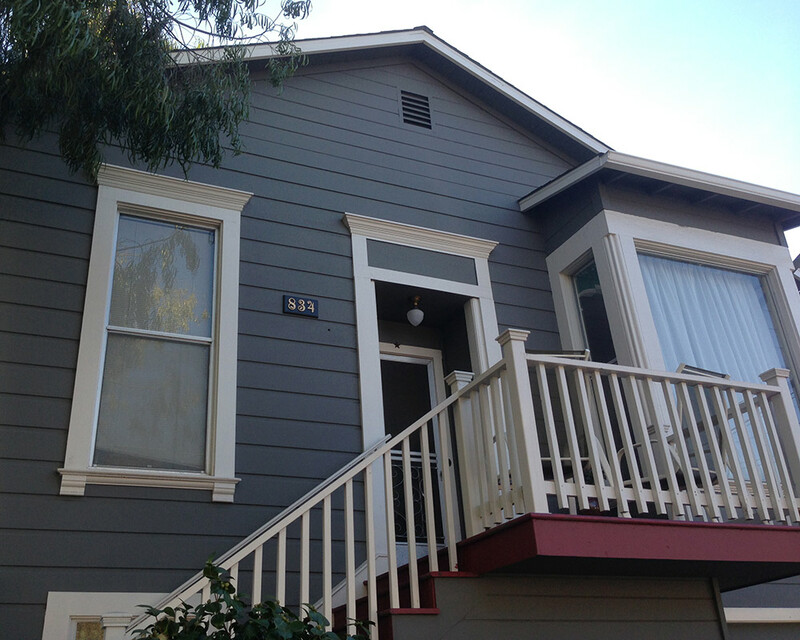 It’s not a mansion, but it’s more house than we EVER conceived of owning in the Bay Area. We weren’t looking to go bigger, it just happened to be the bargain when we set out to look. So our new mortgage isn’t as small as we’d hoped it would be by moving, but it’s less money for about twice the square footage. These are MLS photos from some time ago (despite the 2014 watermark), and the paint job isn’t in good shape anymore. There’s a whole lot we want to do to this place, but money is a little tight right now – because of reasons I’ll get to soon. I’ll try to update a little more frequently! Thanks for visiting. We’d talked about leaving the Bay Area for a long time. The reasons were many. The decision was hard. But I miss my house! As you may know, the Bay Area is going through a bubble, making real estate very valuable and making it perpetually harder to live there. We’re not getting any younger and we realized that if something happened to either of us we’d be financially screwed – almost no margin for error. So we made the decision to leave the places and people we’d both grown up with and set out for greener (literally) pastures. We wanted to be ready to sell by the summer season and we made it. The same realtor we bought it with sold it for us last June and with all the work we’d done on the place we got a lot of offers. Selling a house is hard, both emotionally and physically but it went well. Moving to another state is hard too. The whole thing was tough but I’m glad we had the option to improve our situation. The first six months in Portland were spent in an apartment that we rented sight unseen. It was a perfectly nice little box with zero soul, but it gave us the chance to look around and figure out where we wanted to be. 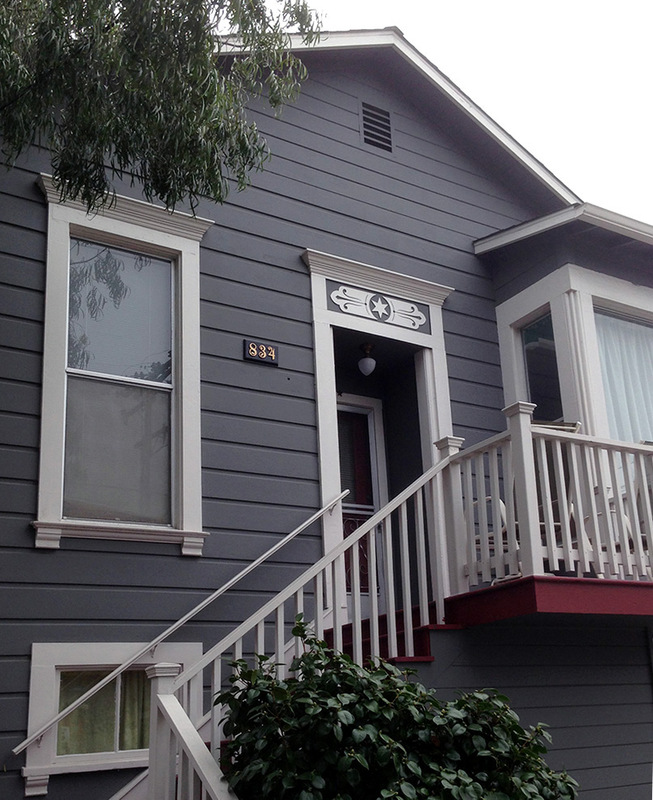 We found a very good real estate agent through a co-worker who gave us the lowdown on neighborhoods and took us out. We ended up negotiating a good deal on the first house we made an offer on. Our agent fought hard for us and we got a new roof and new plumbing out of the deal. So where do we live now? Another 1890s Victorian! I’ll show you around next time. I just wanted to get this update out, finally. It was hard to write. Thanks for showing up. 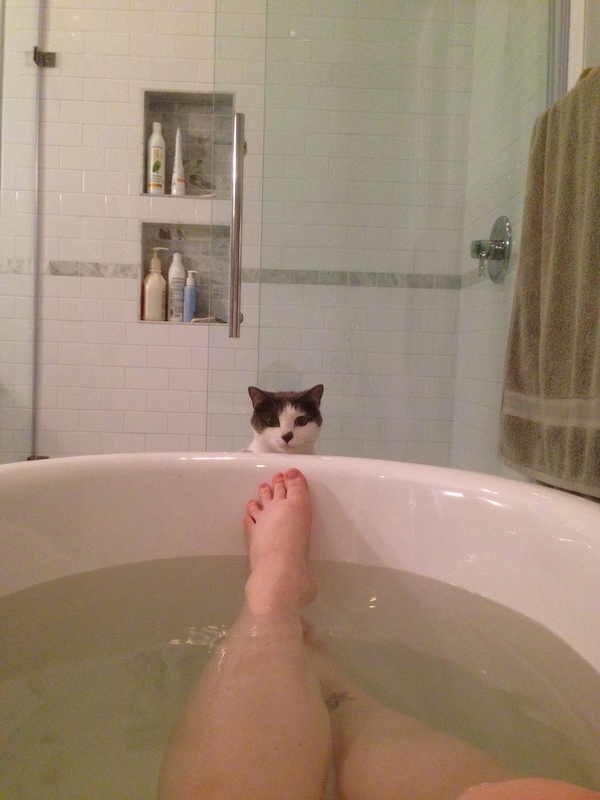 I need to tell you that we’ve moved. That’s why I’ve been offline so long. 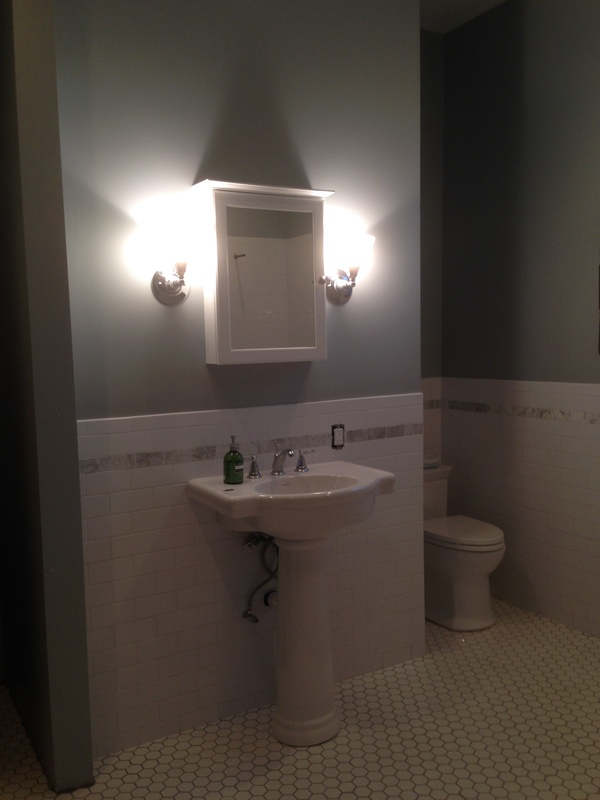 I’m sure the explanation of that (and introducing our new house) will make for a long post, but before I get to that I want to show the beautiful bathroom we finally made and left behind. We were without a shower or upstairs toilet for about three weeks. We did have a toilet in the basement but it required going outdoors to get to. There was also a shower at my work that I used, but it was a sub-optimal situation overall. But that’s what happens when you have to replace a whole house’s worth of 60+ year old galvanized plumbing in addition to a stripped-to-the-studs remodel (with bonus discoveries of rotted wood!). So what did we finally do? 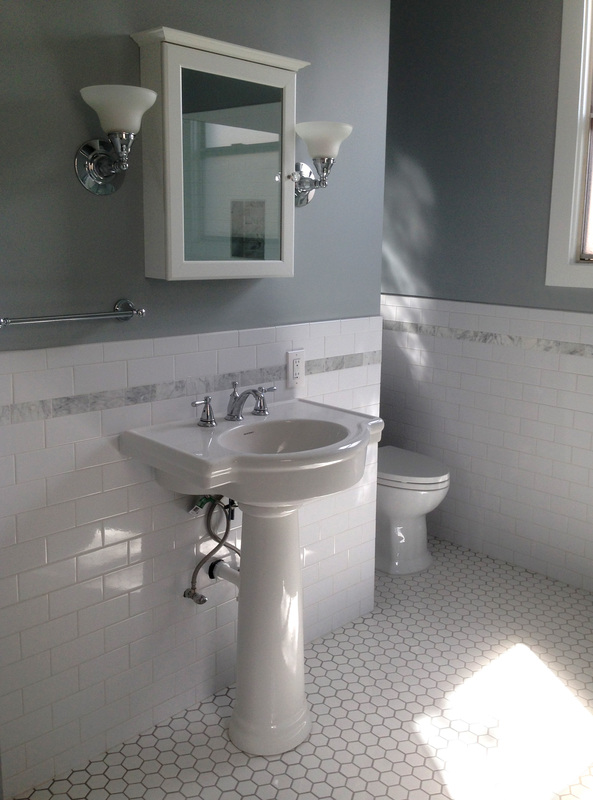 Whole room, 4-feet high of plain white subway tile with a bullnose edge and a single stripe of smaller Carrara marble near the top. The subway was simple and cheap. The marble was more expensive per, but obviously a much smaller amount was needed. The floor is 2-inch white porcelain hexagons. 2-inch was not the easiest to find but I thought the scale would work better than 1-inch since the room is pretty big. I found it for $4.25/sq ft from a website but they were backordered and I needed it quick so we ended up paying almost $2 more locally. That said it went for as much as $10 per square foot locally, so I feel like we paid a fair price. Going in I wanted a separate tub, preferably clawfoot, and Randall wanted a snazzy Japanese toilet. Our compromise was getting both. 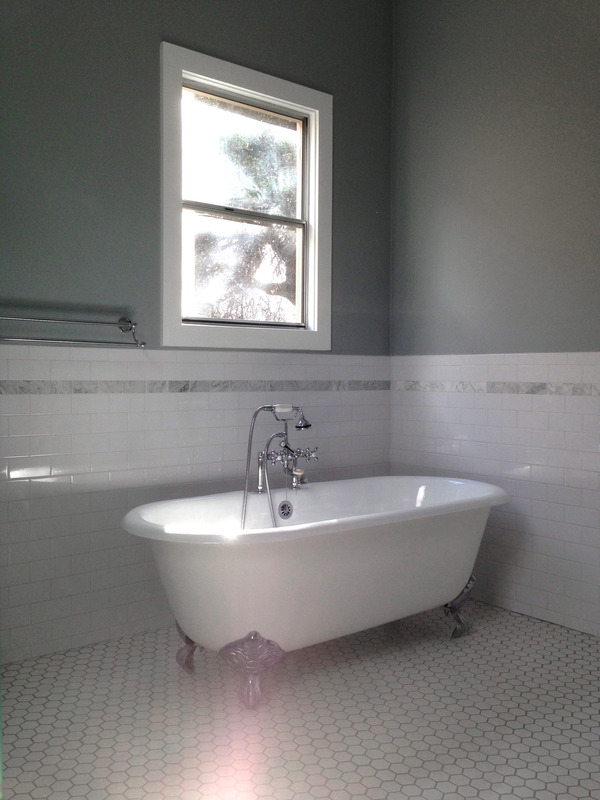 The tub is one of the basic packages from Vintage Tub & Bath. Very happy with it. After looking and pricing Randall scaled back a bit from the super-sentient mecha robo-toilet he had been dreaming of and we selected one that is a nice, fancy-flushing, 1-piece skirted toilet somewhere between classic and modern: the Toto Eco Soireé. As much as I like antique fixtures I don’t think a toilet needs to be period-correct and the design of this one will make it easy to clean (a toilet priority). We got a pretty good deal on it – don’t let the list prices on this stuff fool you. 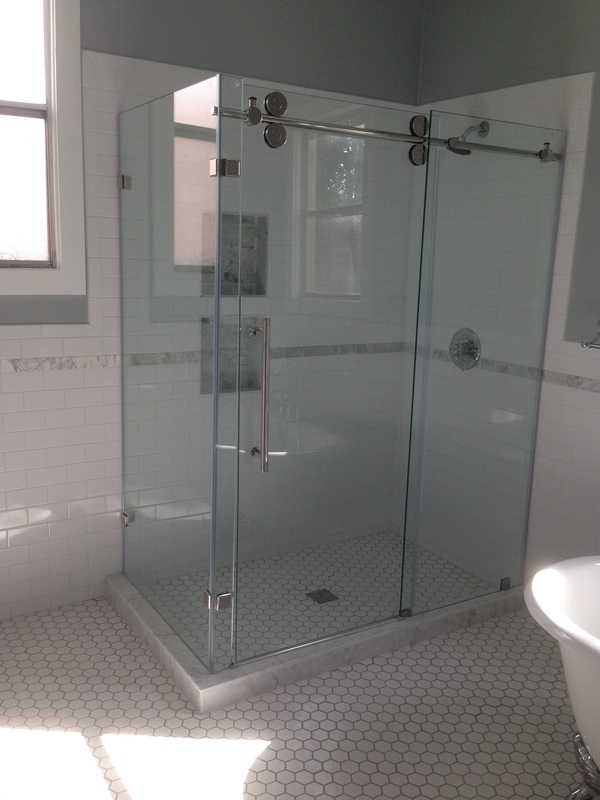 Frameless shower enclosure by Vigo by way of Amazon. Since the sink we had was so new we reinstalled it. 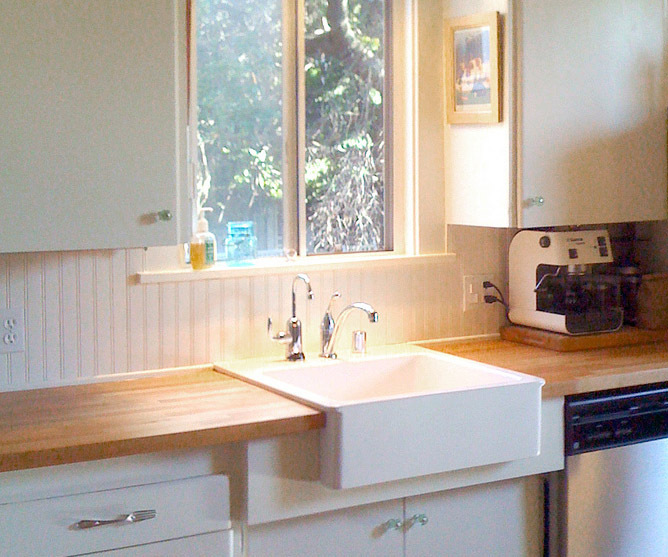 You can’t see it here but tucked in to the left of the sink and that little grey wall was a stacking washer and dryer. Turns out the bathroom is a really convenient spot for laundry. When it was finally done this became everyone’s favorite room in the house, including Mooncookie. Gosh I miss that bathroom. We only had it for a couple of months! 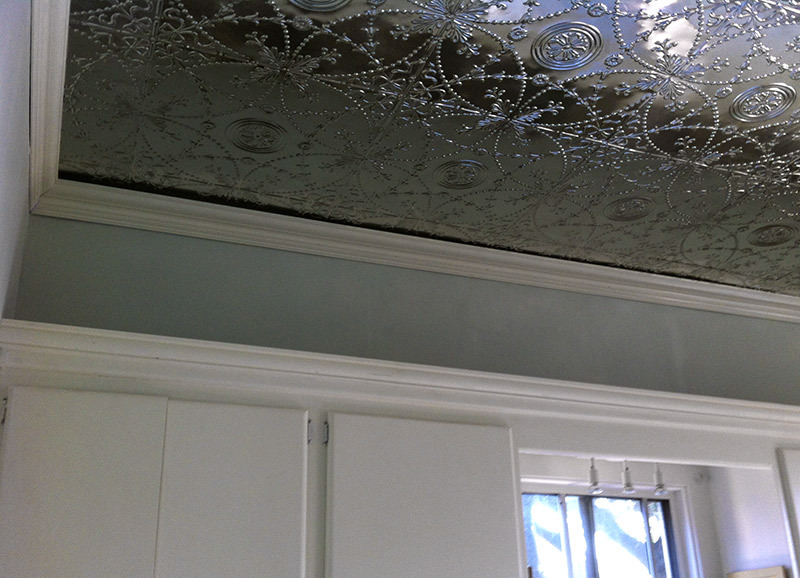 I’m way overdue for a kitchen reveal but things just keep getting in the way. Today that thing is that some dudes are tearing apart our bathroom! We decided to finally do it and our construction guys were available (nope, not DIYing this). And then we realized we needed to finish the bathroom before a family party in early February, so the last week has been a mad rush of ordering supplies and clearing out the bath and laundry rooms. 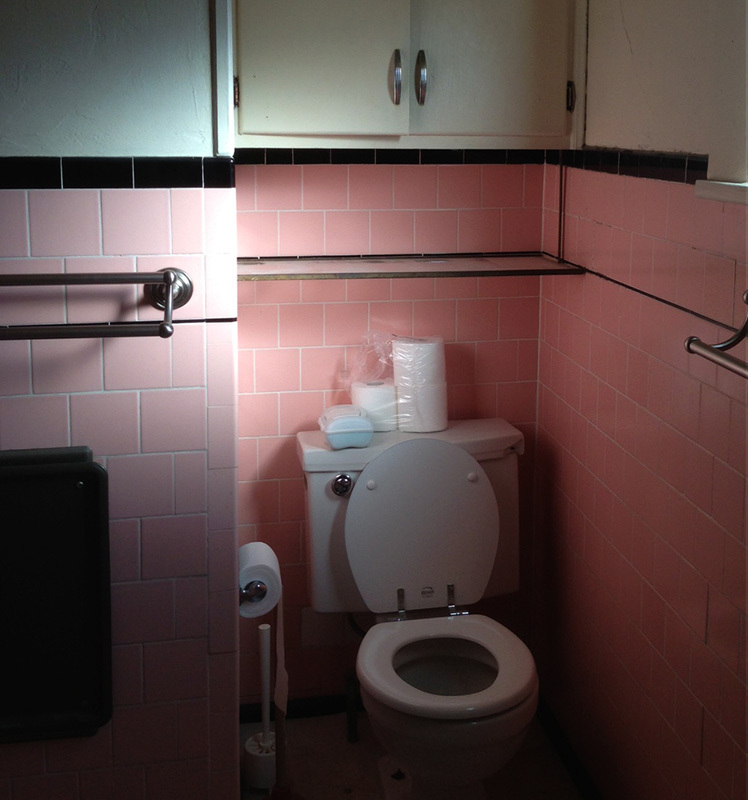 Goodbye pink bathroom. You were darling yet gross, and you’ll be gone by the time I get home today. They’re supposed to finish in under three weeks so I’m sure I’ll post progress pictures soon. 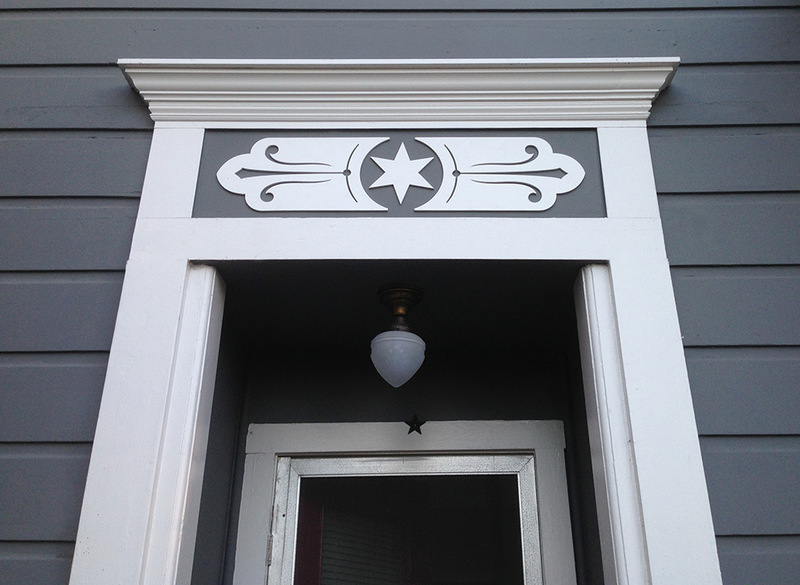 I finally got around to laser cutting the panels for above the front doorway. There’s something about the front of this house that just never looked like the front and I wanted to fix that. Click here to see the progression til now. The panel didn’t come out exactly like I pictured it, but I like it. 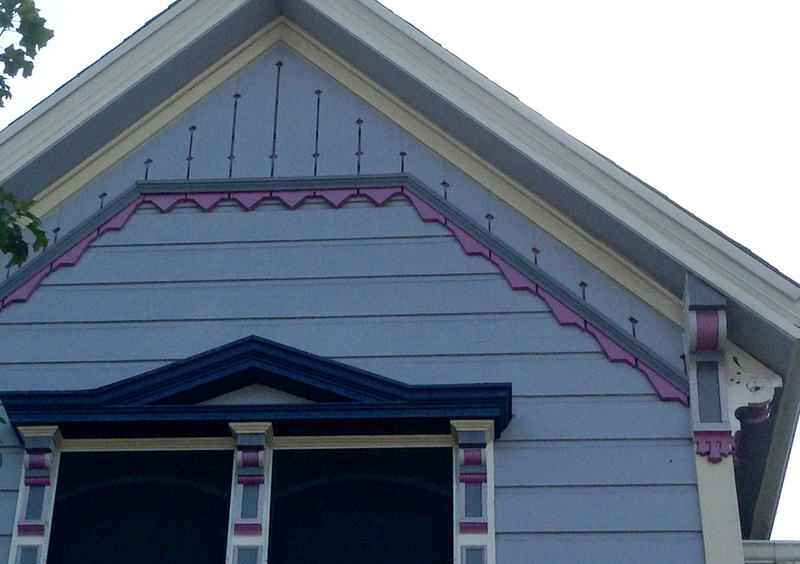 I mean, I’ve definitely seen weirder and more awkward original millwork on California victorians, and it adds some much-needed flair. I may still add an applique to the center to give it more dimension. There were limited material options available for laser cutting, none of them really ideal. I chose plywood despite it being less than ideal. But I had already made the house numbers from MDF (reputed to turn to oatmeal in the rain) and they seem to be doing fine with only moderate protection. But now it REALLY needs a gable or something nice for that vent. 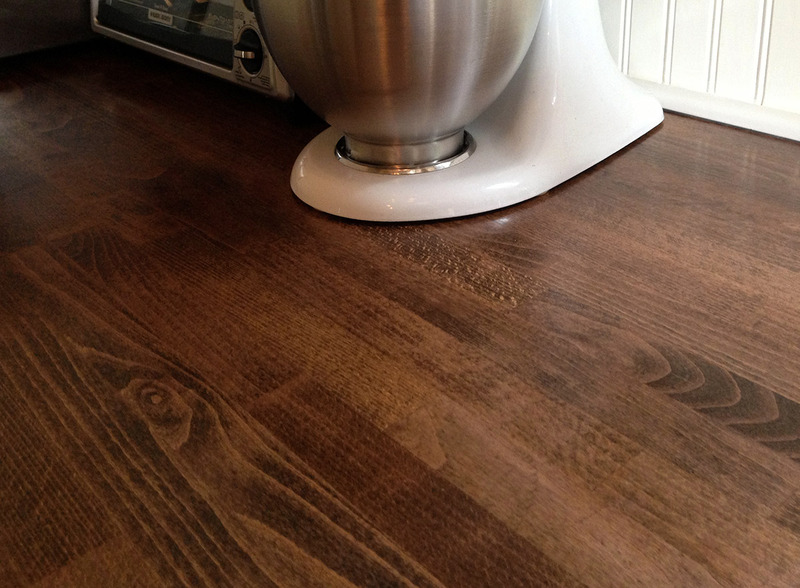 Wood counters. They’re cheap, they’re solid, and good looking, but man they get gross. They started out looking shiny and new (a relief after this). We’ve since used, oiled and waxed them for the last three years, cleaning as we go. And while it’s worked I got fed up with the crud and the dinginess. So I sanded off all the grimy buildup and frankly I don’t want to have to do that again. We don’t cut on them or abuse them, and they doesn’t have to last forever, but I need a lower-maintenance solution. Despite many people finding it an unworthy way to go, this post got me thinking about just varnishing it once and for all. So we did. 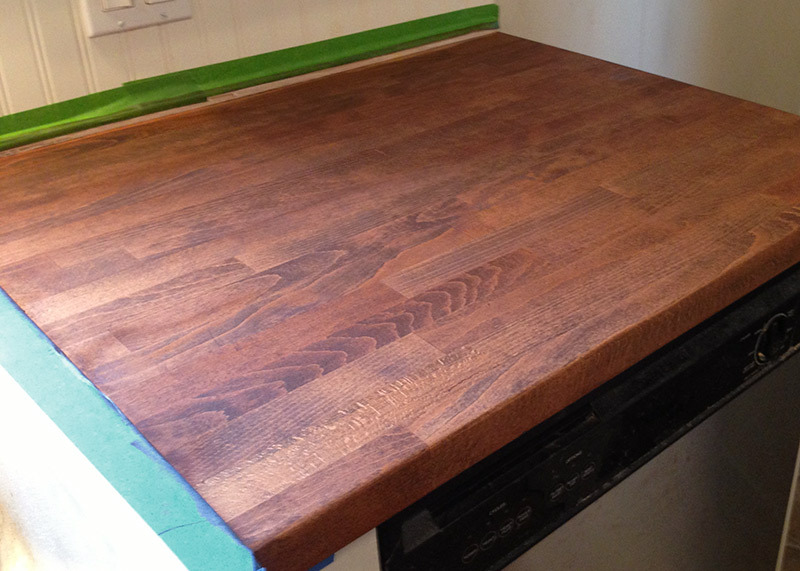 We first stained with “Special Walnut 224.” I wanted a little contrast since the rest of the room is really light now. Don’t let the dimness of the last photo fool you, that’s just fall on its way. I like them! The color is pretty and they’re so, SO much easier to work on now. About 6 months ago I went to an estate sale at this little house on the next block, looked around some and left. 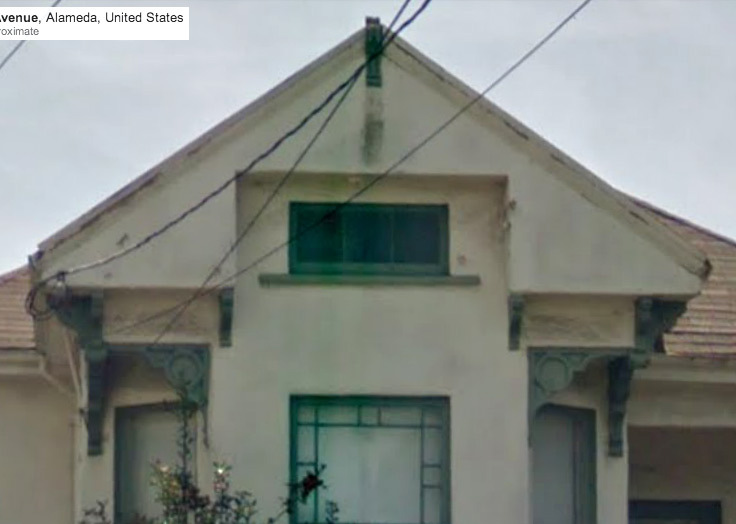 The house looked like someone elderly had lived there for many years and it suffered from what they like to call “deferred maintenance.” Soon after that the house went on the market and was sold. There are some photos on Zillow. 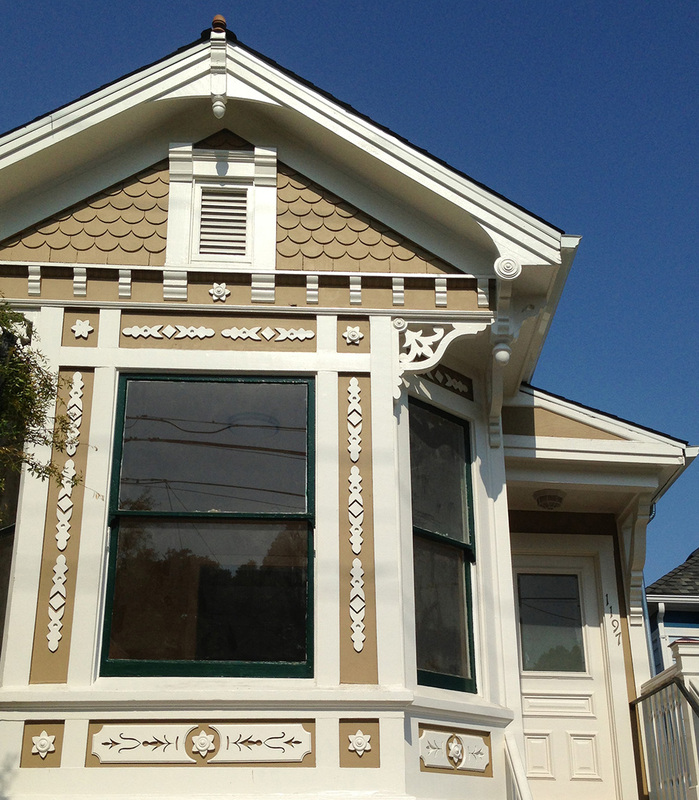 As you can see, it’s a victorian covered in stucco. They left some of the original windows and brackets, but that’s about it. I bring this up because we’re dogsitting for our neighbors and on our walk today I saw that renovations have begun. They appear to have gutted the house down to the studs (it may have needed that), are working on the foundation, and have REMOVED THE STUCCO. And this was hidden underneath. Did they know all this time that it was under there? More or less intact? No really, have a closer look. CLICK IT! I have two Pinterest accounts: One for myself and one for Revictorian. But the truth is I hate logging out of one to maintain the other, so I’m consolidating both into my personal one. I’m still maintaining boards on Victorian exteriors and interiors, and a couple other areas of relevance. If you poke around you may find out more about me than you’d ever hoped, but I’m mostly harmless. And if you happen to be into in poster design, tattoos or antique jewelry, you might find something else you’re interested in. With the kitchen creeping towards completion (but not finished yet), my mind has moved to the exterior of the house. We did a bunch of work on the outside to take it from horrid to okay, but it’s still plain. I spoke to a neighbor who remembered meeting a visitor who grew up here and them commenting how they remembered gingerbread on it. Gingerbread can mean many things to many people, and I’m not kidding myself that the direction we’re going with the outside is historically accurate. 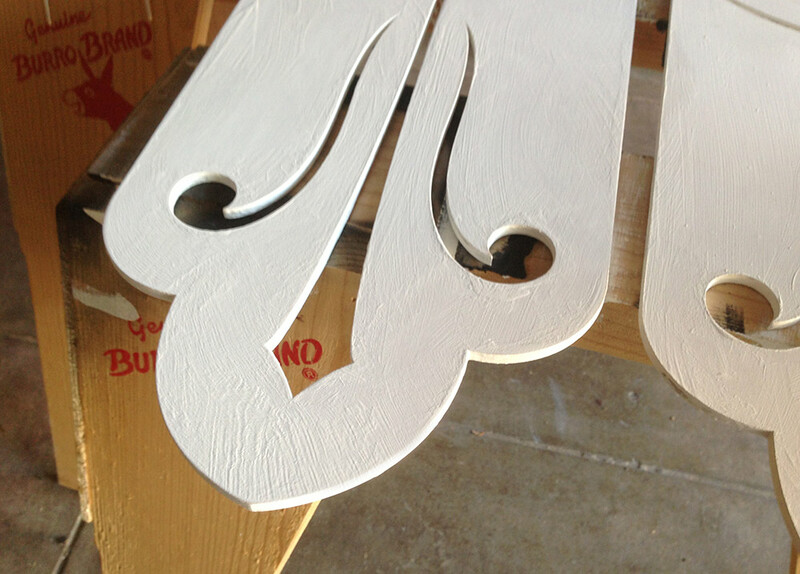 But we’re taking some cues from the moldings that remain and I have plans to bring back some of the old style. I’m starting with the area you see above. 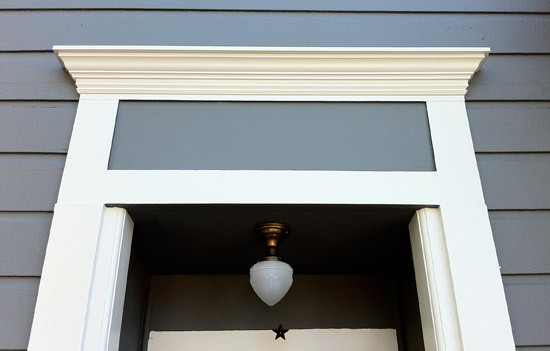 I call it a transom, even though I don’t know that there was actually ever a transom window there. My plan is to make a scroll-cut panel that will lay in the gray rectangle. 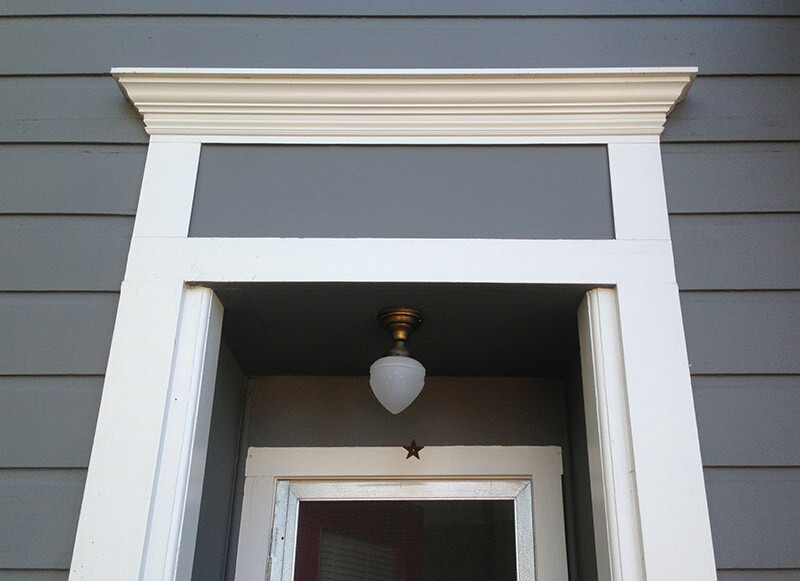 Pictured below is the only remaining corbel on our house, and aside from window casings, it’s all we’ve got to go on. 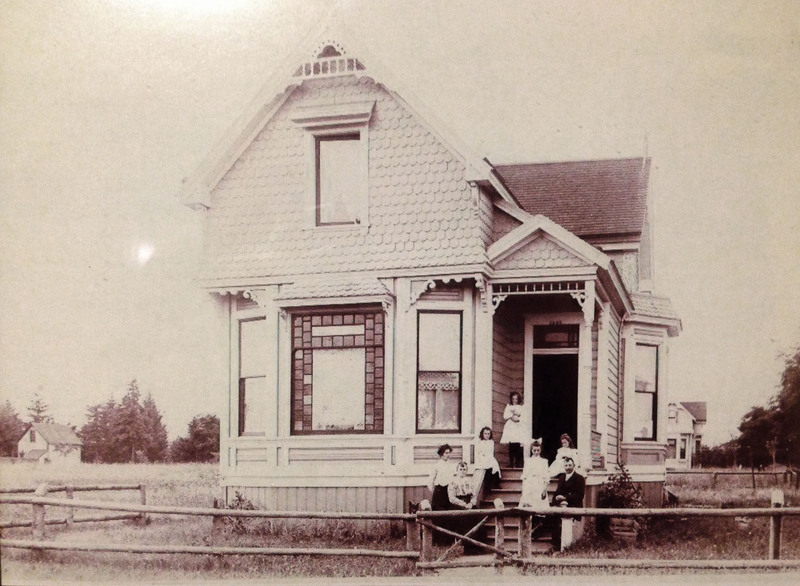 I think our house probably qualifies as a Folk Victorian: a simple, mostly symmetrical residence that used some of the ornament that was starting to become available, but wasn’t built as a showcase for it like a Queen Anne. I poked around our neighborhood and though I’ve never found a duplicate of our house, I looked at some of the millwork on the older houses and got some ideas about what the ornament may have looked like, and what the tools of the time could produce (Our house is either 1890 or 1896, and it was one of the first in the area). These appeared to be the oldest houses around that were still intact. 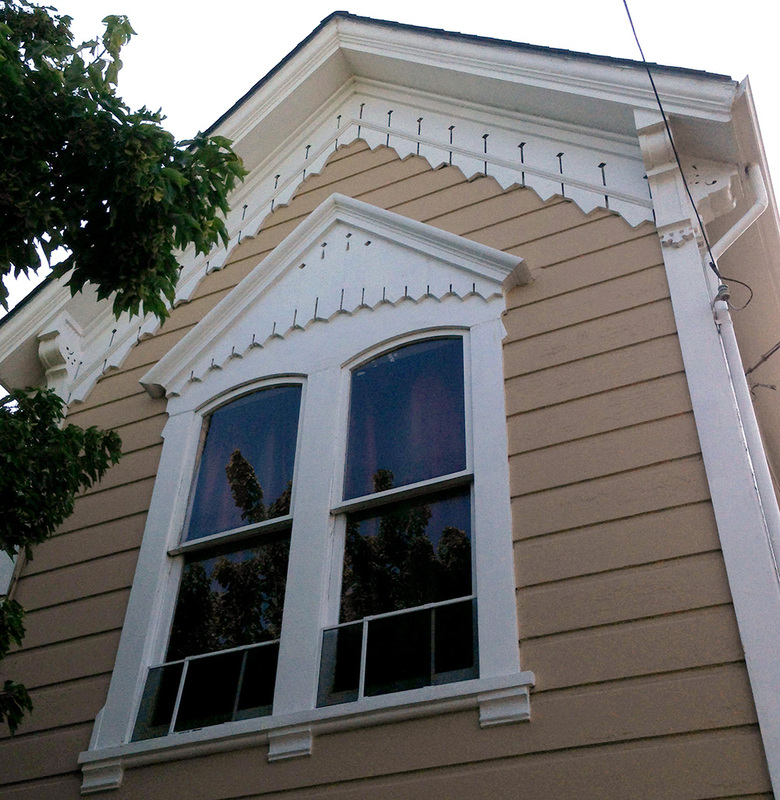 Lacy, scallopy trim with an occasional scrolly corbel or bracket. Clapboard siding, not shingles. These look more like the San Francisco vics I grew up with. 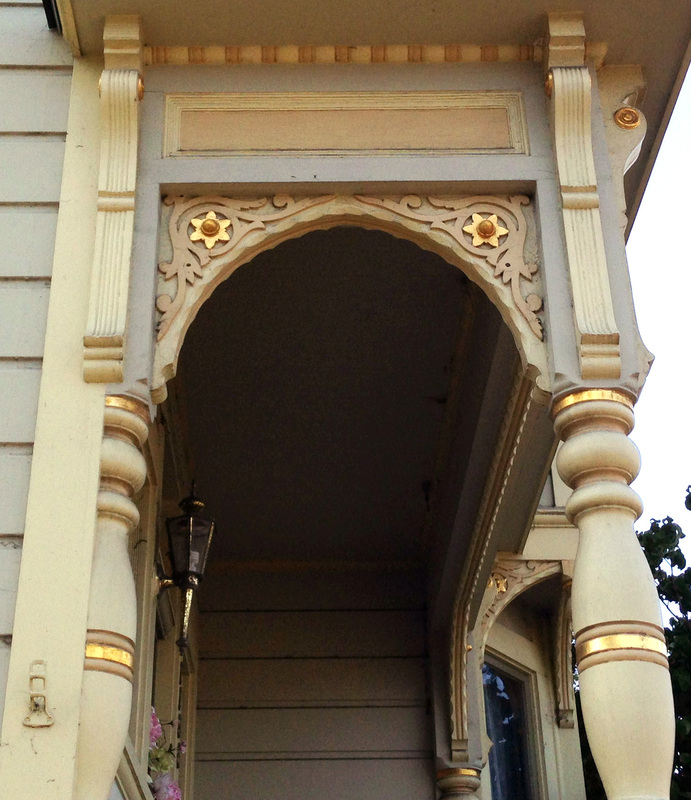 A little more ornate, level upon level of woodwork (the gold balls atop the stars), and scalloped shingles mixing with the clapboard. Even down to the god-forsaken awning. 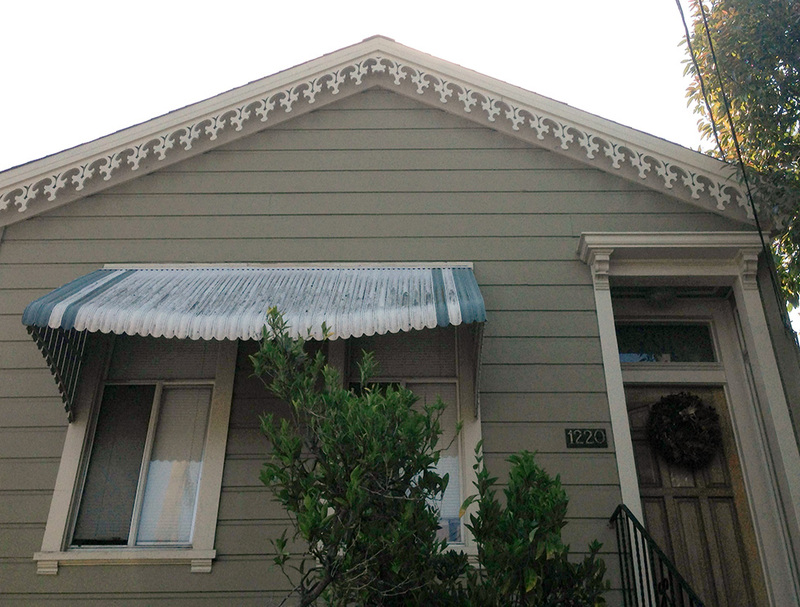 Simple casings, symmetrical roof, plain clapboard. Fancy on the roofline though. Like I said, I’m not looking to make a historical reproduction. I just want the house to fit in with the other houses of the era, working with our budget and our aesthetics. I have no skills with a scroll saw or a jigsaw or a lathe, but I do know my way around computer-aided design and we in the Bay Area are super lucky to have a place called TechShop. You pay for membership, take some safety classes, and then get access to extremely modern tools like laser cutters and 3D printers. Remember the house numbers? Those were laser cut via mail order, but soon I’ll be able to operate a cutter myself. I get gleeful with the possibilities! It’s not final. I can never stop messing with designs til the last minute. But it’s simpler, and I think it should be. But I’m sure I’ll also cut a flower center like the one at the top, just in case we don’t like the disk/orb. Disclaimer: It may be a little while til I actually get to cutting – our part-time son Max is here for the summer, and well, I have priorities. What do you think about the design? How would you dress up a simple house? But a combination of budget and my masochistic DIY impulse lead us to something else. I have mixed feelings about what I’m about to say, but it’s the truth. We copied someone else’s design. And not a big corporation’s design, a small shop’s design. I didn’t do it for profit and it’s not exactly the same, but I admit that I don’t feel totally good about it. We saw a simple but unaffordable chandelier in a local store and I could tell that it was something we could make if we could find the parts. So we did. 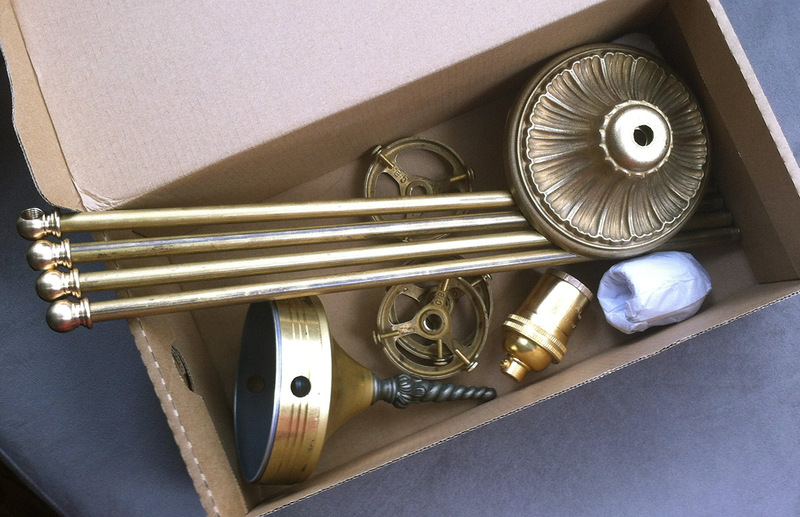 A little internet research yielded a couple of excellent lamp part suppliers: Grand Brass and Antique Lamp Supply. Between the two of them and several orders (having never built a fixture from scratch we missed a few parts the first time) they had everything we needed. 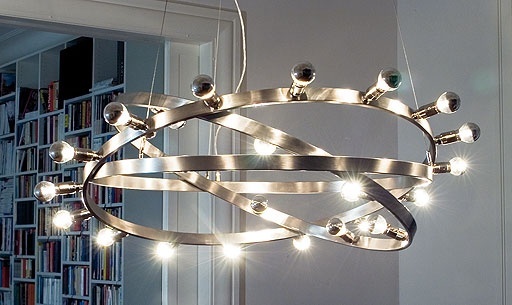 All told it came to a little less than half the cost of the fixture it was modeled on (about $200 vs. $500+). 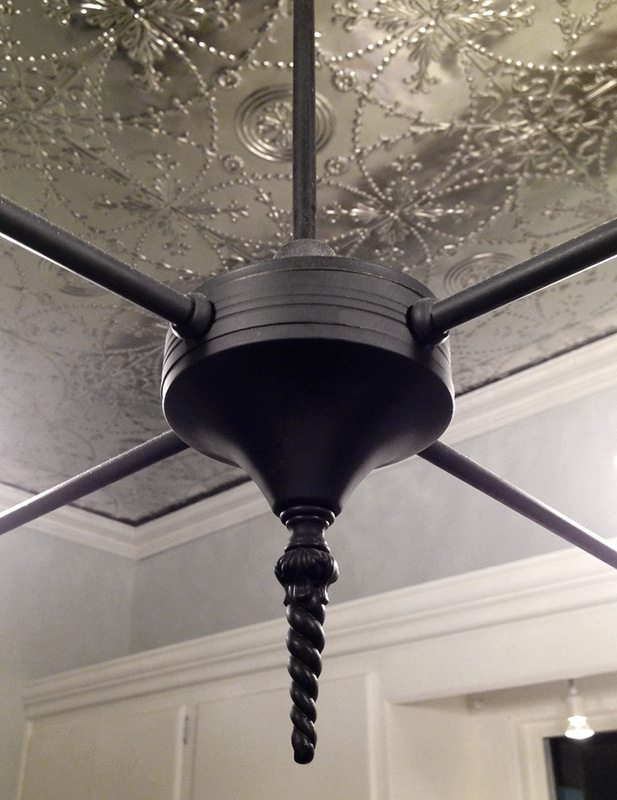 Even though all the parts are brass we planned on doing a blackened finish so as not to conflict with our crazy silver ceiling. 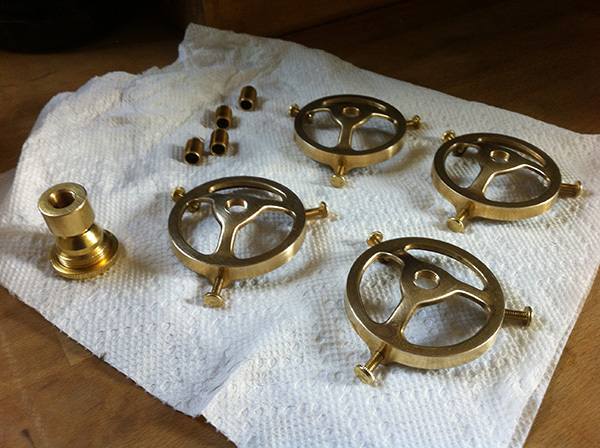 They make blackening solutions for brass, but the parts didn’t all start with the same finish texture and blackening solutions are finicky at best. 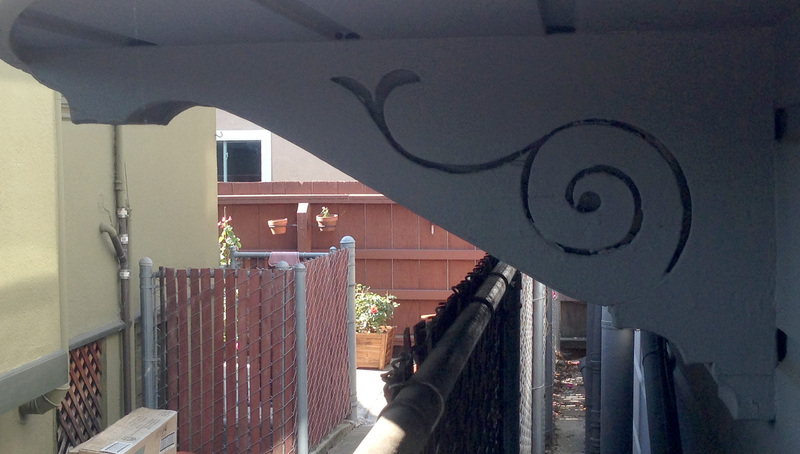 So I scrubbed them all and bought high-temp outdoor flat spray paint, made for barbeques. I was hoping it would be durable like appliance paint but no such luck. That’s okay though, it’s not like people are going to be touching it. Once painted, assembly was simply a matter of screwing the parts together and wiring the sockets. It got a few scuffs after assembly so I gave the whole thing another coat of paint. In the meantime our friend and electrician Joel came over and moved some switches and put a new box in the ceiling for the chandelier. He had a giant drill bit that took a core sample out of the ceiling the exact size of the mounting box that he managed to get dead center. That was a great relief because I had been picturing myself on a ladder trying to cut a perfect circle in the metal ceiling using a sawzall. And while he was there he installed the light too. So here it is. 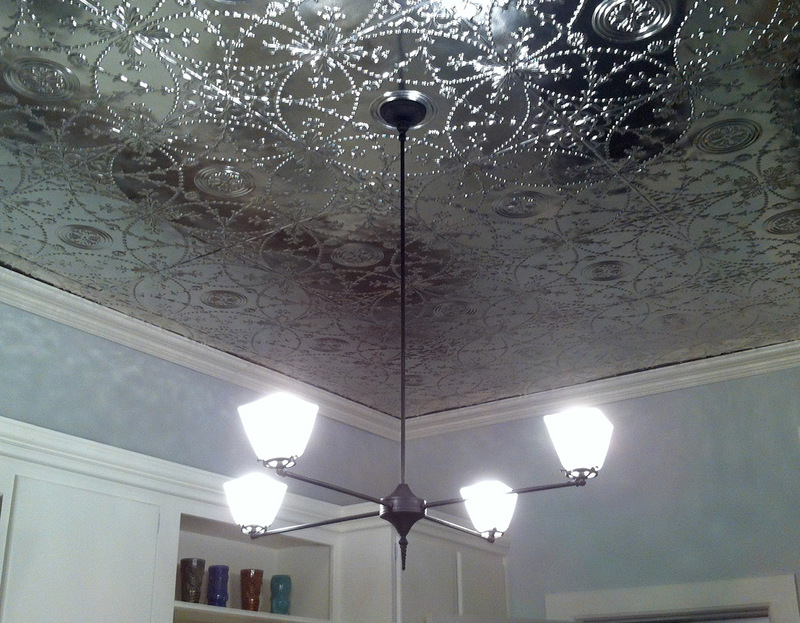 Simple 4-arm uplight chandelier with sandblasted square shades. Unassuming but bright. No fuss to compete with the ceiling. And of course it features the sigil of our house: Unicorn horn! Working on the kitchen has been an exercise in fits and starts. One task would begin, then be delayed, then another part of the project would rear its ugly head. Rinse, repeat. So it’s been hard to figure out a good point at which to write an update here. But here goes. 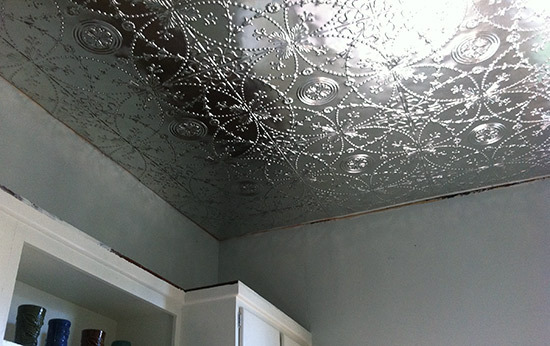 Application of the ceiling tiles continued as before (I followed this guide). I managed to kill one brad gun and a case of Liquid Nails before I was done. It wasn’t a complicated task, just a laborious one, especially since installing from the center outwards is non-intuitive and the tiles needed to be overlapped in a single direction across the whole ceiling. I used a big guillotine paper cutter to fit the tiles to the edges and the attic door. Did I mention that instead of clear-coating the first 3 tiles I accidentally used white paint instead? Yeah, it took me 2.5 tiles to figure that out. Because of that, I used every last good tile and Randall had to scrub paint off a couple of the ones I messed up. After about a month of working on it for an hour here or there (and a surprise week in NYC), it was finally all covered. But just as important was the finishing. 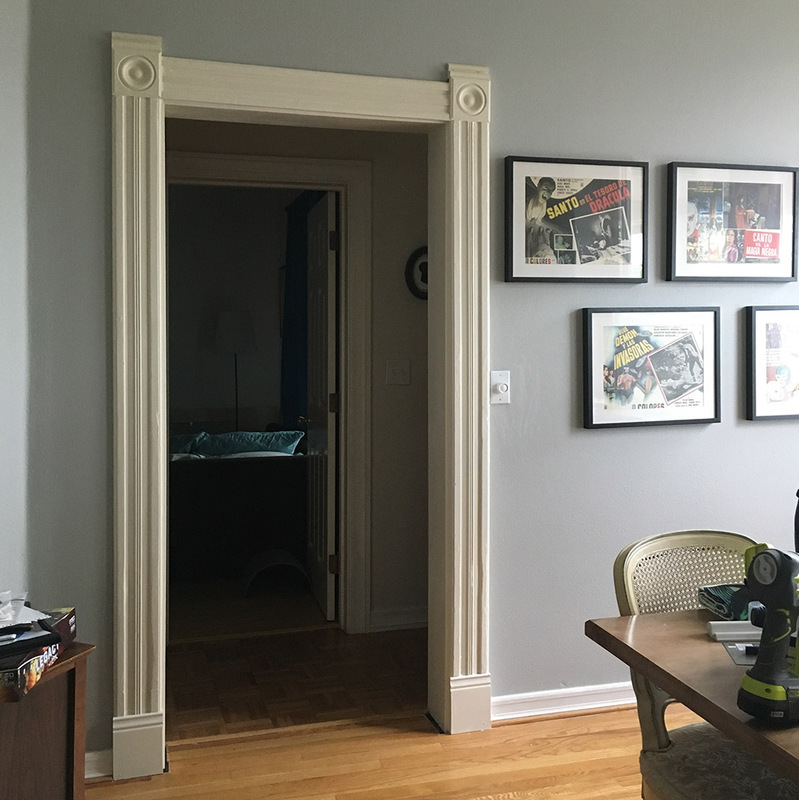 Crown molding to hide the junction of wall and ceiling and also a molding around the top of the cabinets to give them less of a mid-century look. 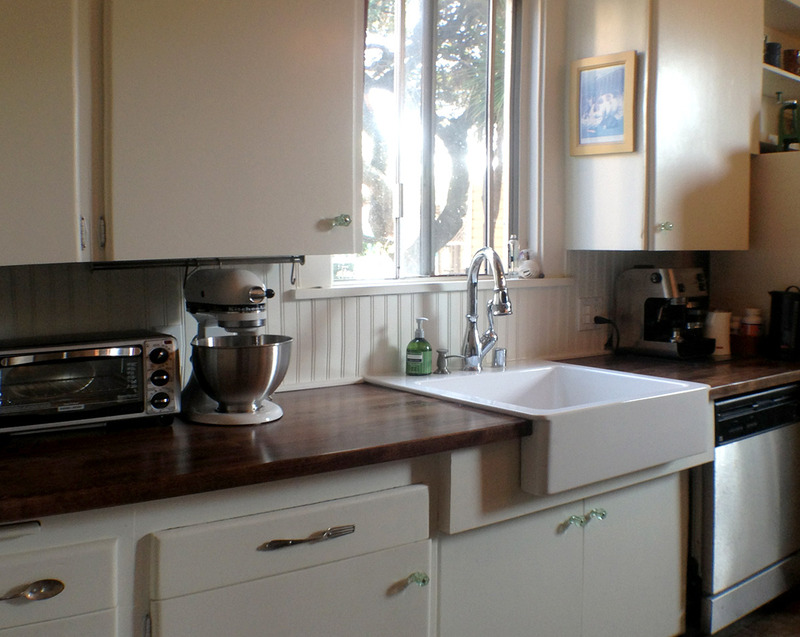 I started with the cabinets since it would be small, flat pieces of molding that I could handle alone. Measure, cut, paint, nail. The crown was another story however. A weird, complicated 2-person job. 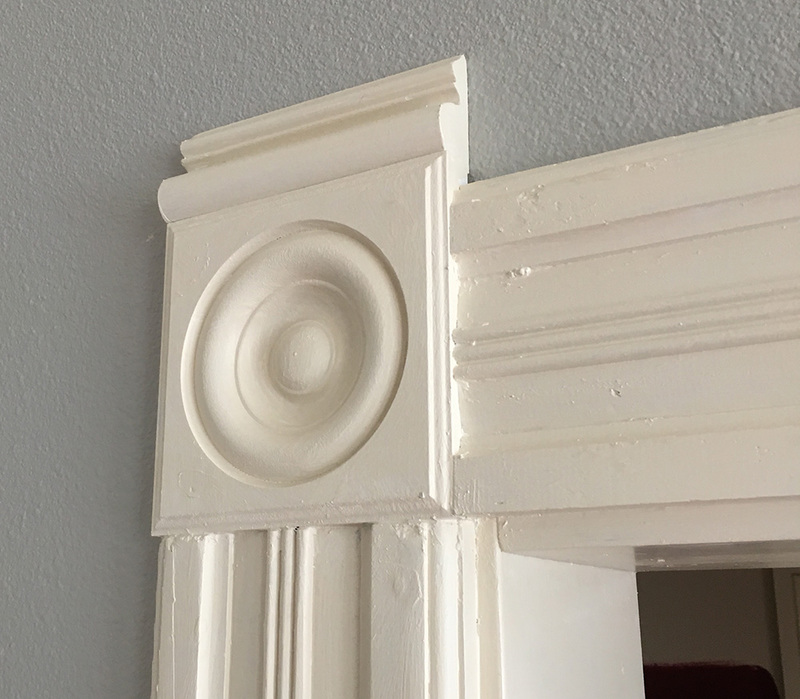 I was heartened by this post, but it seems that a rotten first try is required in the crown molding game. After much second-guessing, heated discussion, and exhaustion, we got it installed. 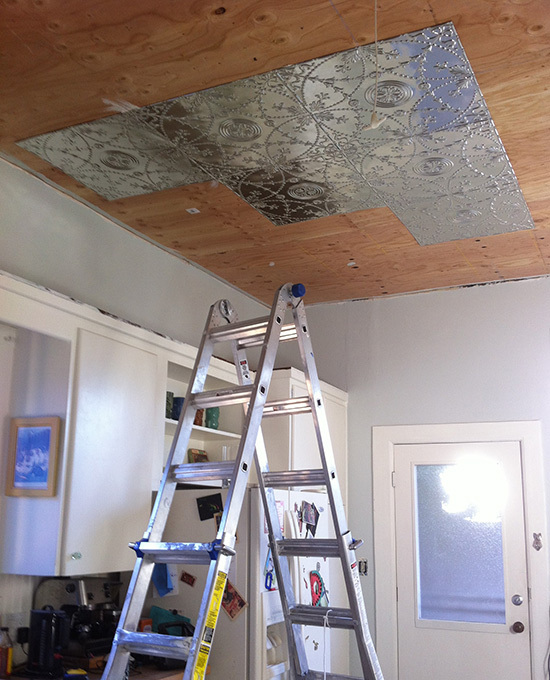 But it’s not our finest work… the lumpy walls and ceiling saw to that. Ooh, that gap! It IS gappy, no question. But we did the best we could (first timers!) and hopefully the razzle-dazzle factor will make these problems disappear for less critical eyes. It’s looking pretty smart! Though now that I see it all together the room looks more buttoned-up and proper than I expected. I’m sure we’ll fix that. 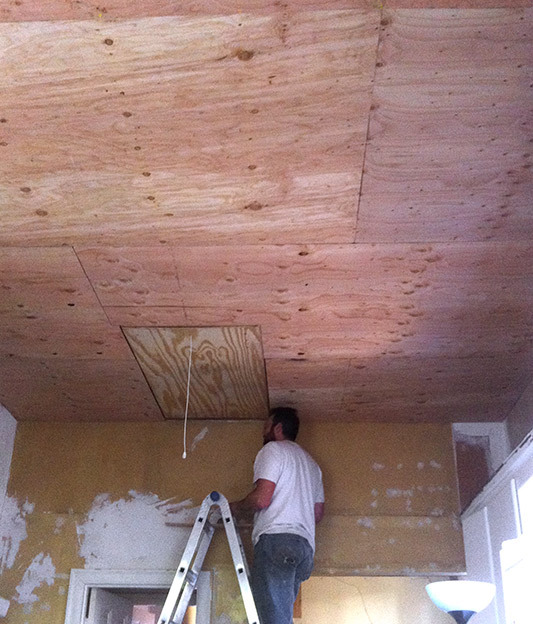 Aaron made it over and plyboarded the whole ceiling. I’m glad he did because I’m quite certain we couldn’t have done it ourselves in three times the amount of time. Oh look, he’s already done! And there you can see the pull-down door to the attic. We all took a moment to celebrate our shared victory. 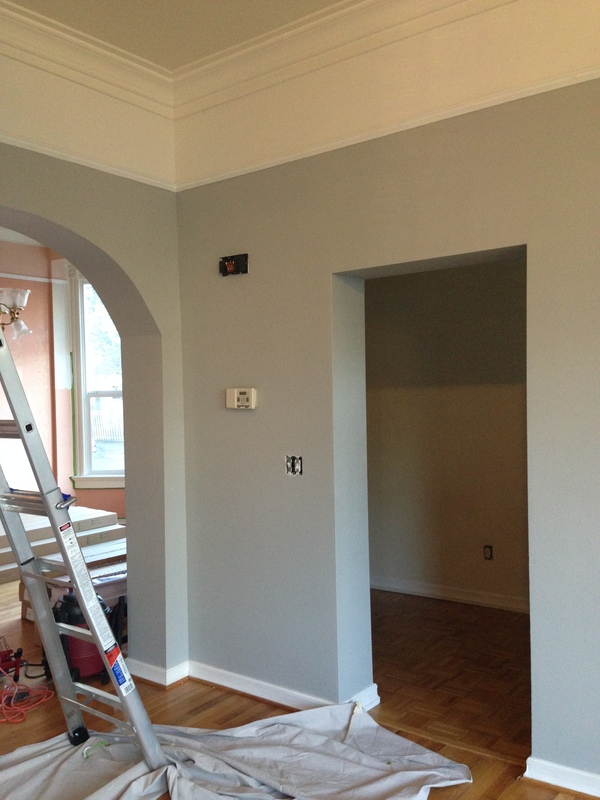 Since my last post I finished resurfacing the walls and repainted them using the light cloud color I showed before (it’s Benjamin Moore “Healing Aloe”). It looks pretty good. 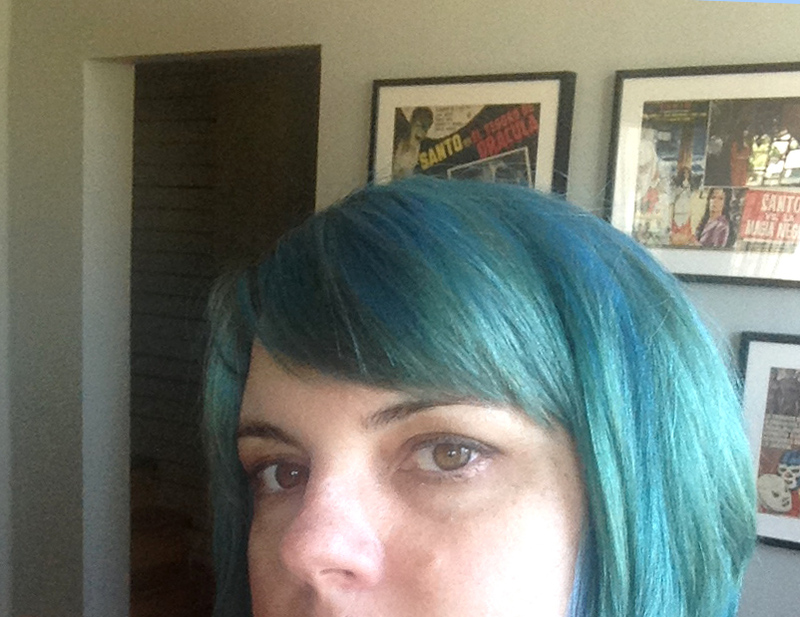 The color is annoyingly baby blue sometimes, but I like that it changes to gray and greenish depending on the light. 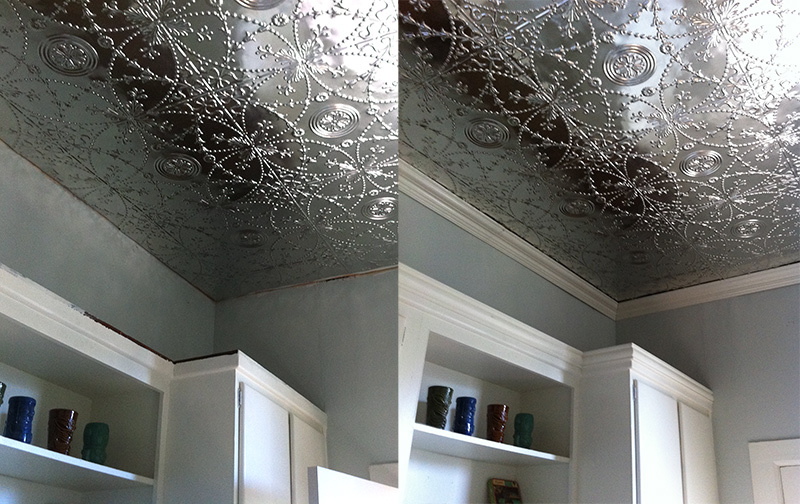 I also clear-coated the ceiling tiles ten at a time in the garage. Fume-tastic. 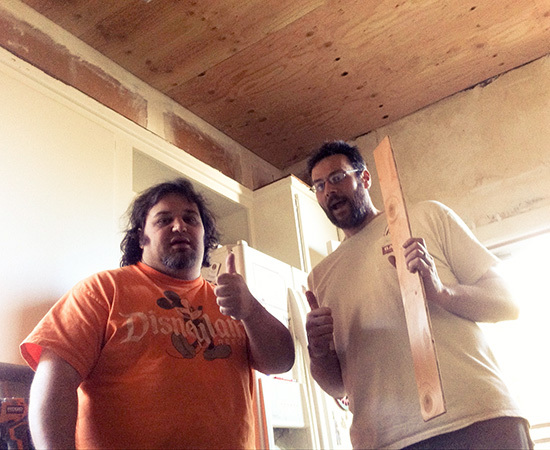 When Randall and I got some time to work together we set about measuring the ceiling and finding the center point. We marked it by making a cross with chalked string. You snap the string against the ceiling and it leaves a blue chalk line all the way across. 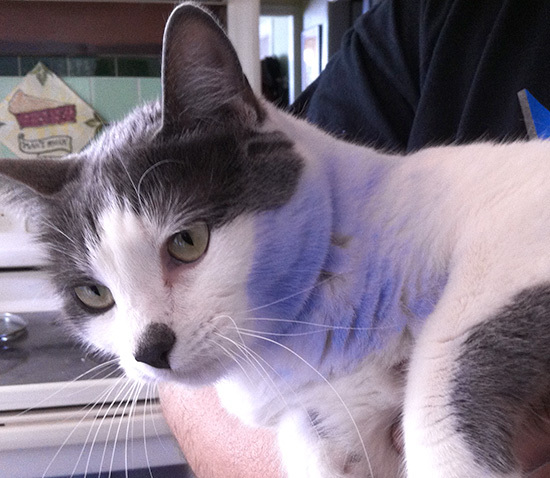 It also left a puddle of loose chalk on the floor that Mooncookie thought it would be fun to roll around in. She looks embarrassed. She should be. She was shoving her face into it like it was catnip. Randall gave her a bath while I went on with the ceiling (I got the easier job). 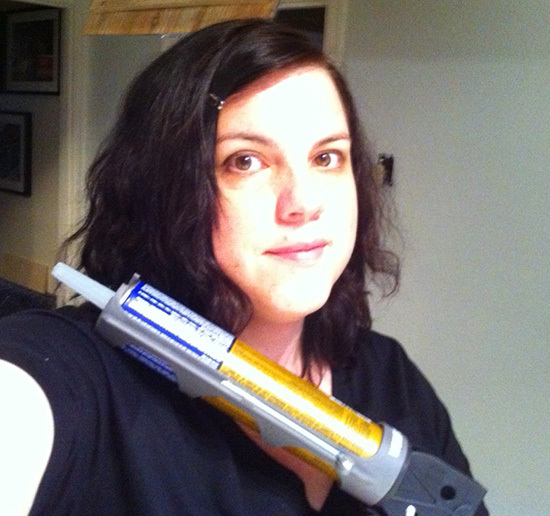 I was jealous of everyone else getting face time in this post so check out this weird picture of me posing with a caulking gun! Gluing the first tile at the center point, I worked outwards as I went, checking to make sure the grid remained square. That’s not too hard but the tiles also need to overlap so that the raw edges face away from the entrance of the room. 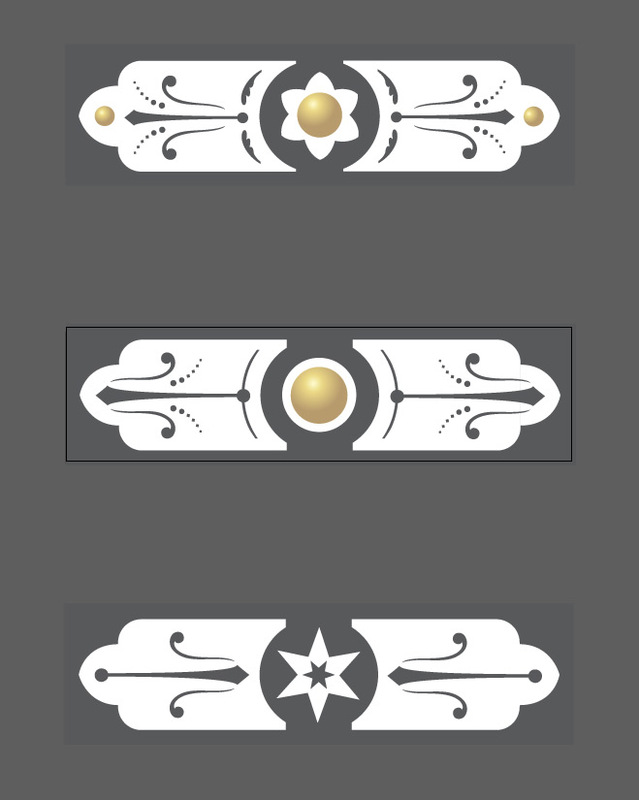 They definitely look cleaner in that direction, but it’s hard to apply them that way when working from the middle. Also it was pretty clear that we’d need reinforcement nails and the amount of glue we purchased wouldn’t be sufficient either. Back to the store we went for a full case of glue and an electric brad nailer. But check out that wall color! Look at those flashy tiles! They’re a little ostentatious but I think it’s going to turn out pretty as heck.